A burn is one of the most devastating injuries. It leaves in its wake both physical and mental anguish on a child. Many burn injuries are accidental and are a common cause of unintentional injury – preventative care can reduce the likelihood of an unintended incident. 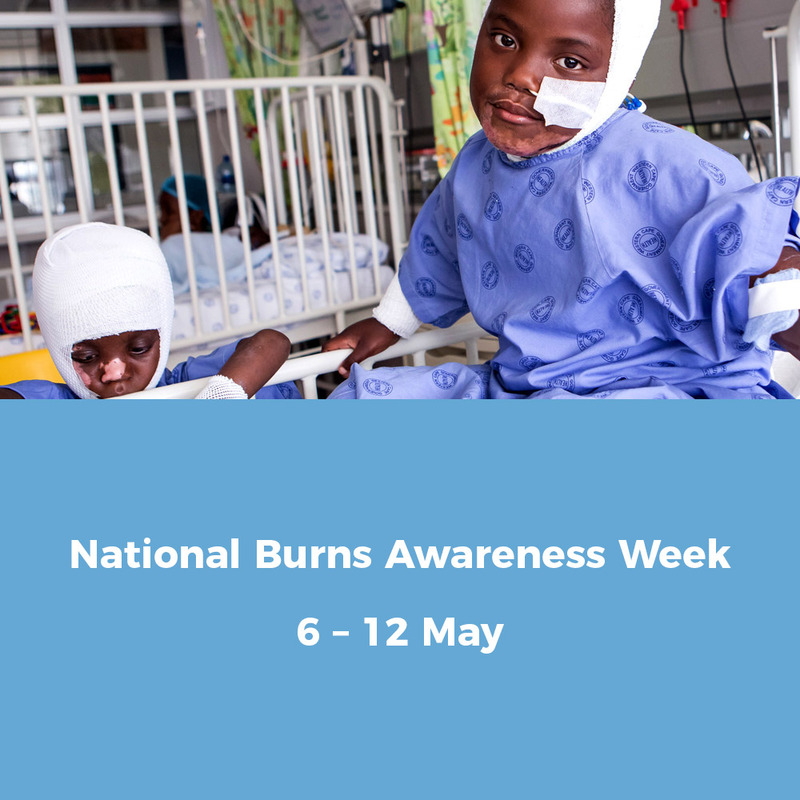 In observance of National Burns Week from 6 – 12 May, Red Cross War Memorial Children’s Hospital encourages the public to learn about preventing burn injuries and protecting children. Red Cross War Memorial Children’s Hospital has the only specialised paediatric burns unit in Africa. Every year the hospital treats approximately 3 500 children for burns (which includes children who are treated in the Burns Outpatient Clinic); approximately 1 300 of these cases are severe burns. Children’s skin is thinner than adults’ and their skin burns at lower temperatures more deeply, making them susceptible to harsher burns with long-term effects. The greatest cause for burns in small children is fluid burns, comprising 84% of burn injuries treated at the hospital. Eighty-five percent of burns patients treated are younger than six and 98% are from disadvantaged communities. As the winter months approach, the use of candles, paraffin stoves and open fires increase, placing children at even greater risk. Invest in a cordless kettle. View your kettle as a weapon. Put all hot drinks, hot cooking oil and hot porridge out of reach of children. Do not carry urns or pots of boiling water around while there are toddlers on the floor or children running about. Turn pot handles away from the front of the stove. Put candles in a deep glass bottle with sand in the bottom so it will be put out if it falls over. Repair all faulty electrical plugs and leads. Report stolen cover plates on power poles or substations with broken fences or locks. Do not leave children unsupervised near matches, candles, lighters or fireworks or when they are in or near the kitchen. Lock paraffin and other flammables, including “safe” gels away. Do not cover braai fires with sand. The heat stays in the sand for hours and will burn unsuspected feet walking over the sand. Pour water over fires and coals. Do not cook eggs in a microwave. The shell can explode and cause severe face and eye injuries. Noodles cooked in microwave ovens become extremely hot, along with the container, and can cause severe burns. Pour cold water in the bath first and then add hot water. Set your geyser to low temperatures (about 55 degrees). Always test the bath water with your elbow before bathing children. Avoid using tablecloths or anything a child can pull on and cause hot food or liquid to spill. Test and stir all food before serving children to make sure it is cool enough to eat. Should anyone sustain a burn injury involving flames, the victim should stop, drop and roll to put out the flames. Do not touch electrical injury victims before removed from the current – use a stick or non-conductor to avoid rescuer injury or death. The heat from a fire, hot water or electrical burn will continue to burn the tissue long after the offending contact is removed. It is essential to stop the burning by keeping the burnt body part under cold running tap water for 20 minutes. Do not use ice or ice water; it can cause frostbite because the skin is already damaged. Do not apply butter or any oil-based product to a burn injury, the oil can trap the heat and make the burn deeper over time. Burn injury happens in seconds but can change a person’s life forever. Recovery is a life-long process – it continues long after discharge from the hospital – and rehabilitation starts on day one. Burn injury not only affects the injured but also the families who love and support that person, therefore Western Cape Government Health urges parents and caregivers to be aware of the dangers posed and to take steps to keep their families safe.